Reservations, though, were not easy to obtain. I made my L'Astrance reservation nearly two months to the date and even that required some negotiation. When the much anticipated day finally came it was cold, dark, and rainy. Trekking through the Paris metro with damp clothes and squeaky shoes was uncomfortable. Particularly because the metro stations become slippery death traps when wet. After a fourty-five minute struggle through what seemed to be a tornado we arrived soaked and hungry. Perhaps by chance, perhaps because we were embarrassingly wet, we were seated upstairs away from the other diners. But I really liked the birds-eye perspective this gave us of the dining room. It felt like, just for a moment, the restaurant was ours. Cuiller de parmesan crémeux - Thick wedges of butter-laden toasted brioche with small bubbles of spherified parmesan. The small bubbles tasted like cheese but had a creamy and silky smooth molten texture. We were also brought thick slices of bread by Jean-Luc Poujauran. Dr. Loosen 2006 (Wehlener Sonnenuhr) Riesling Kabinett - Fresh lime from the nose through the finish lends a juicy and invigorating streak, and a distinct sense of wet stone, too, provides a cantus firmus. Just kidding. But that's what they say here. Purée d’asperge verte, yaourt au sésame, lait au champignon - A tall shot glass of asparagus purée, sesame yogurt, and mushroom-infused milk foam. The raw asparagus created a smell similar to freshly cut grass. This reminded me more of an occasional wheatgrass shot than something I would want to drink regularly. A generous salting would have helped to better bring out the asparagus flavor, but this still tasted too fresh and overall unappealing. The pairing with the sweet riesling somehow made the asparagus taste sweeter, however, and made this a great combination for an otherwise weak course. Galette de champignons de Paris et foie gras mariné au verjus, huile de noisette, citron confit - A speciality of chef Barbot. This entire layered cake was raw, not a single component cooked. Thin slices of button mushrooms with verjuice-marinated foie gras. Orange zest was sprinkled throughout the layers to add a hint of acidity while brightening up the mushrooms. The paper-thin layers of mushroom were supported by a crispy layer of brik dough. The pleasantly squeaky cold wedge was dusted with a salty porcini powder. This nearly carbohydrate-free dish was fascinating conceptually. This is the only dish that can always be found on the menu at L'Astrance, everything else changes constantly. I really liked this. Langoustines juste poelées, soupe thailandais, legumes et fleurs de printemps - A Thai-influcenced course of flash-fried langoustines served alongside coconut milk, lemongrass, and ginger. The langoustines were cooked just to the border of raw and soft leaving the stringy and creamy texture intact. This was delicious and the lightly charred flavor from the shell added a smokey component to the broth which really brought everything together. This was paired with Loimer 2006 Grüner-Veltliner "Kamptal," whose dry acidity helped break down the creamy coconut broth. Asperges vertes et blanches au cumin, purée de cédrat, sauge cassis, amandes caramélisées - Thick stalks of white and green asparagus seasoned with cumin and Andean silverleaf sage. The cumin added a tannic element to the asparagus with a hint of smokiness while the sage added a subtle frutiness. This was served with a very bright quenelle of lemon purée, bringing a very strong acidity to the dish. The addition of lemon wasn't bad, but it strongly contrasted against my anticipation of how the dish was going to taste. At first I didn't like it, but as I approached the dish from a fresh vantage point, I really liked how the lemon brought out the sweetness of the asparagus. The dish was decorated with a few caramelized almonds which added a chewy but sweet crunch. This was paired with a 2004 Riesling Wineck Schlossberg (Alsace Grand Cru) which was dry and nutty. Sériole sautée, coquillages cuisinées légèrement, purée des légumes verts, confit d'agrumes - A sautéed filet of yellowtail with an entire small abalone and large mussel. The abalone was firm and smooth making it essential to slice it thinly to maximize flavor. The yellowtail was tender, soft, and flaky: the light pan searing really locked in the juices. This dish was seasoned with nothing more than salt and a hint of butter letting nature speak for itself. This was served with a watercress purée adding a vegetal bitterness to the palate of flavors. There was also a bright citrus confit tucked away behind the filet which made this dish a bit sour. I really liked everything on the plate except the sharp inclusion of citrus. My palate was a little sore from the sourness the citrus had added to the previous course. This was served with Domaine de la Louvetrie 1993 Muscadet Sèvre-et-Maine Fief du Breil (Jo Landron). Saint-Pierre cuisiné lentement, chou-fleur, piment doux, câpres, puntarelles - Slow-cooked John Dory with cauliflower and a bed of capers, red peppers, and puntarelle, a bitter Italian vegetable in the chicory family. One of the things I like most about John Dory is the smooth and butter flavor it develops when lightly cooked. The fish here was a little too firm for my liking. This might have been the intention of the dish, I just wasn't used to it and it was difficult to overcome my preconcieved notions of how the dish should taste. I'm also not crazy about capers and the acidity they contributed to the dish; it sort of made me pucker my cheeks. I'm still not sure if I liked it; this was the third course in a row with strong acidity and sourness. This was served with Pierre Gonon (2006??) Saint-Joseph Les Oliviers (Blanc) whose minerality rounded out the bright capers. Poitrine de porc, haricots blancs, émulsion de chorizo - A thick slice of pork belly with equally thick stripes of meat and fat. The fork-tender meat literally melted in my mouth. It was served atop a small bed of white beans and chorizo dashed with chili and paprika. Everything about this dish was wonderful, from the doneness of the meat to the subtle spice the chili added to the fatty layers. My friend Julien who shared this meal with us was so enamored with this course that he snuck to the bathroom to ask for a second round. The restaurant served us a second course with as much enthusiasm as I had anticipating its arrival. This was served with a full-bodied Bodegas Toro Albalá 1922 Viejisimo Solera Amontillado which really cut through the pork's fatty mouthfeel. Poularde de Bresse aux morilles, fondue de parmesan, sauce au vin jaune - My god this was amazing! This was the softest, most tender, juciest piece of Bresse hen I have ever tasted. The browning of the skin made it seem like it was roasted, but my friend Julien insisted it was cooked on the stove. The cooking process removed much of the fat from the skin leaving behind an ultra-thin layer of crispy flavor. The chicken came a bit undersalted for our tastes, but our waiter fixed that. An extra pinch of salt and this dish was outstanding. The meat sat atop a bed of parmesan fondue, sautéed morels, and a sharp vin jaune sauce. This was the highlight dish of the afternoon. It was also paired with 1996 "Mysterre" Vin de Table (Patrice Lescarret; Dix ans de voile). Sorbet piment-citronnelle - Lemongrass and hot pepper sorbet. I tried something similar to this at Alinea where habanero pepper was infused in water and later distilled to remove all the spice while leaving behind the pepper's sweetness. Here, the spice remained creating a twist of cold and hot in the mouth at the same time. I can't say this tasted great, but it was very stimulating to my palate. This was paired with the very sweet and fruity 2003 Graacher Himmelreich Riesling Auslese. Sabayon à l'orange amère, nougatine - Bitter orange sabayon with nougatine. Bright, sour, delicate, and airy. Tartelette pistache-abricot, mousse de rhubarbe - A pistachio and abricot tart with rhubarb mousse. This too was surprisingly light and airy with hints of lemon zest to further brighten this up. 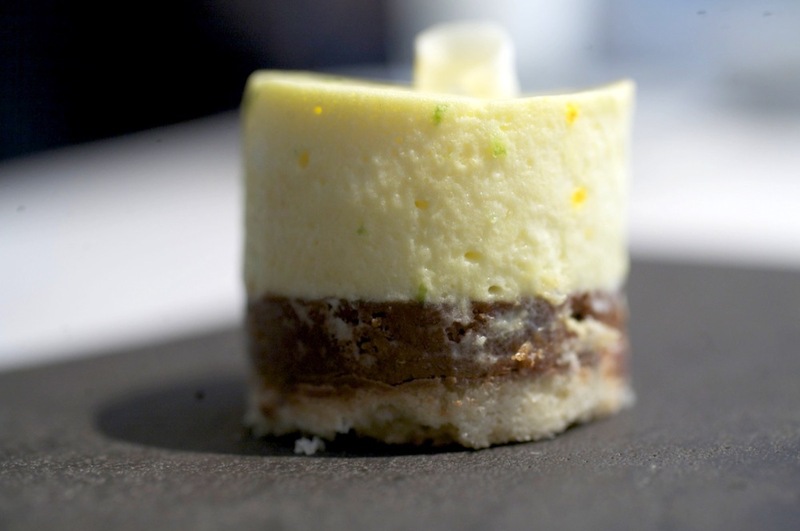 Mousse au safran et citron vert, sablé breton - A cylinder of saffron mousse adorned with lime zest. This sat atop a buttery cookie crumble. My girlfriend noted that the fruity mousse tasted sort of like Trix cereal. This wasn't necessarily a bad thing ... just funny. Barbot's use of acidic elements in all of his dishes really shined through with the desserts, particularly in this case where the citrus tasted great alongside the saffron mousse. Lait de poule au jasmin - Jasmin-infused eggnog inside hollowed-out eggs. I couldn't help but think that this smelled like a home cleaning product. The eggnog really tasted good however; it was light and creamy with subtle sweetness. Madeleines au miel de châtaignier - Chestnut and honey madelines. These were very good, but think about how much better they could have been had they arrived warm like at Daniel Boulud restaurants. What a difference temperature can make. Fruits frais - A gorgeous plate of grapes, mango, orange, and plump and juicy medjool dates. The dates were so exceptionally juicy we asked for a second round. They really were outstanding. Barbot's cuisine is precise, intentional, and exceptionally careful: all ingredients are methodically prepared ensuring accurate cooking. But at the end of the meal I was left in a bit of confusion. On the one hand there were some courses I loved. The Poularde de Bresse, for example, was the finest cooking of hen I've ever experienced. Barbot's obsessiveness with fresh ingredients really came through with his unabashed use of raw vegetables throughout the meal, as if to say, "these vegetables are so fresh, they don't need cooking." And he'd be right. It really takes a level of humility and confidence to take a step back and let nature speak for itself. However on the other hand, there was an almost obsessive need to include strong acidity in every course. While this is something loved by many, my palate is very sensitive to sourness and at times I found this off-putting. More than three quarters of the meal was influenced with sourness. Thankfully most of the acidic components were side accompaniments and I could control their inclusion with each bite. This was very clever: it's there if you need it, but not required. I guess that's just a difference in taste. Sommelier Alexandre Jean's pairing was so scrupulous that there were several courses where I didn't particularly care for the dish but when paired with the wine the amalgamation was exceptional. I would argue that Alexandre Jean's pairing is essential to maximize the experience. I really enjoyed my experience at L'Astrance. But it's a bit of a a bit like roulette as the menu and its focus changes on a daily basis. It's possible that the overwhelming acidity was simply the focus of the day's menu, though I doubt it. I hope to return to return again to L'Astrance again sometime soon. Hopefully when lemons are out of season.